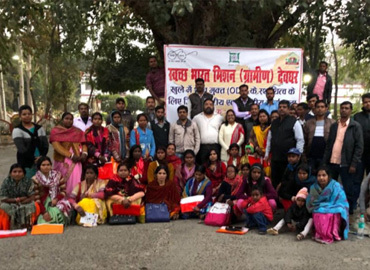 Feedback Foundation facilitated a District Level ODF Sustainability Workshop on 22nd January, 2019 at Deoghar, Jharkhand with support from Tata Trusts. Deoghar District was declared ODF on April, 2018 and the District administration, with the objective of developing a strategy to sustain the ODF status, organised this workshop at Circuit House, Deoghar, which was attended by 52 participants from 9 blocks of Deoghar including few from Dumka district. Participants included Ex Engineer PHED, District Coordinators – SBM (G), CInI representative, Programme Coordinators, State Resource Persons, Jalsahiyas, Social Mobilisers, Panchayat Secretary, Swachhagrahis and NGO representatives. This workshop provided a platform for all stakeholders to brainstorm and analyse, plan and strategize a road map to achieve the goal of ODF sustainability.